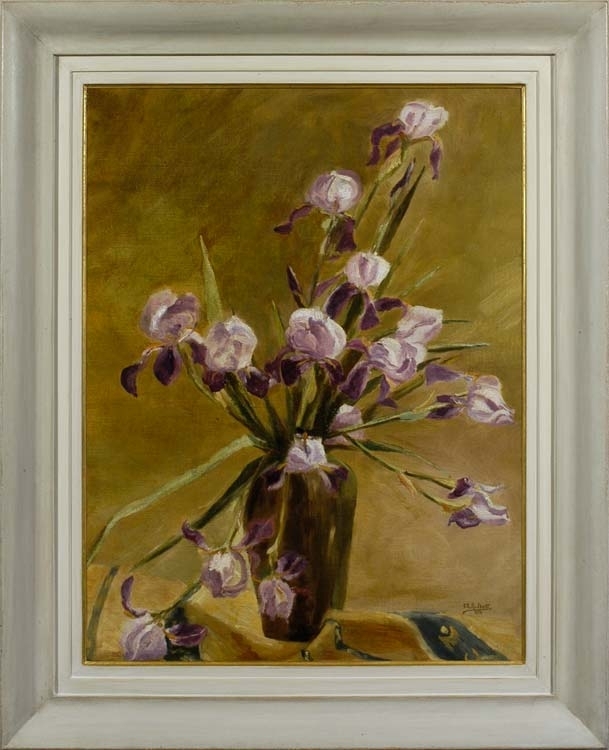 Alice Halkett painted this study of iris in a vase when she was about nineteen. She was evidently the daughter of her father, prepared to tackle a complex arrangement, full of fore-shortenings and difficulties of tone relative to the background. Still life does not seem to have figured in her father’s output; his work consists mainly of portraiture, figure studies, genre scenes and paintings of industrial settings (a series painted in a sugar factory), with some (generally urban) landscapes. But flower painting was seen as fitting for an accomplished female in the late 19th and early 20th centuries; moreover, it was something which she might continue to do throughout her life, without falling from the ladylike to the bohemian. About 12 years before Alice’s birth her father had joined L’Essor, the Belgian avant garde circle of Aesthetes and Symbolists, and it seems clear from this painting that he had brought Alice up to appreciate a canvas as a flat decorative surface (cf. Maurice Denis), and to compose a picture as a patterning of contrasts and complementaries. Very little is known of Alice Halkett, save this one work which ties her to a specific date. She was the daughter of François-Joseph-Clément Halkett (1856-1921), the Belgian painter of genre scenes and portraits who exhibited in Brussels, Berlin and Munich, receiving an honourable mention and a bronze medal at the Paris Salons of 1885 and 1886, and a silver medal at the 1889 Exposition Universelle. He painted the members of his family frequently, so we know a portrait of Alice at seven months, confirming her date of birth to be either 1894 or 1895. He lived in Brussels (83, rue de l’Aqueduc), and was descended on his father’s side from a noble Scottish family. In 1882 he joined the circle of artists known as L’Essor, which included James Ensor, Leon Frédéric and Jean Mayné. Alice Halkett presumably trained with her father; she may even have inherited his paintbox, which was sold at auction some time ago. It is unclear why so little of her work has surfaced, as this painting of iris is extremely competent for a nineteen-year-old. It is most probable that she married young and then painted purely for pleasure. Her work may still be saved in a family home somewhere.